News spreads quickly in the 21st Century. Word was coming in from my friend Farrell vacationing at his home in Palm Springs. He’s close enough to feel the quake, but not close enough to be adversely affected. It’s a quiet night in Ocotillo, CA. Well after dark it’s still in the 90s and bone dry. If you’ve never heard of Ocotillo before don’t feel bad. Few have. It’s a tiny desert outpost near the Mexican border in Imperial County. Thanks to Google’s Street View you can see what it looks like during the day. Not much! Nothing important happens in Ocotillo. Tonight was no exception. Nothing happened in town. The action was 5 miles southeast of Ocotillo and 4.3 miles underground! It happened at 9:26 PDT. That text came to me less than two minutes later. News spreads quickly in the 21st Century. The word was coming in from my friend Farrell vacationing at his home in Palm Springs. He’s close enough to feel the quake, but not close enough to be adversely affected. Here. 10 seconds Just felt aftershock. I scrambled to the USGS earthquake site. They’re very good with automated info quickly then geologist screened updates later. There was nothing. I know. Weird. The original made enough noise where we heard the trees shake. By this time I was scouring raw data looking for something that might not yet have bubbled to the quake reports. I found the coded data and entered the latitude/longitude pair into Google maps. It wasn’t a place I recognized. USGS report is misleading. We felt it hard. Where’s that? Very much. It’s less than an hour from us. The info flow was getting thicker. 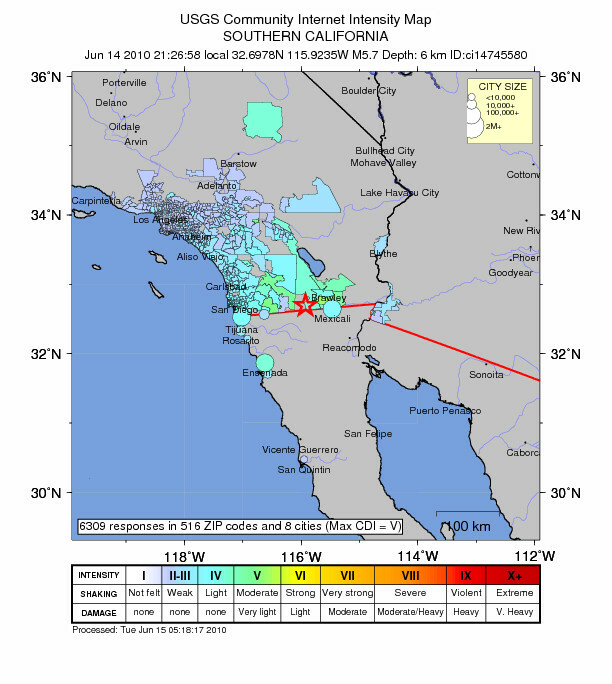 The USGS shake map was starting to fill showing light reports from the Los Angeles area and more substantial rocking on the US/Mexico border. In San Diego the Padres game was halted for a moment to allow the stands to stop shaking. Back in Palm Springs Farrell had made the decision this rumble wasn’t going to be his problem. He’s sent a few more texts since the first. Aftershocks have come, gone and been felt in Palm Springs as the Earth tries to adjust to new pressures built by this upheaval. This is not the big one! Tomorrow on the news we’ll look at video from the Padres game or some fixed surveillance camera trained on falling canned goods and this quake will fade into history. Nowadays news travels fast and burns quickly. Max and I were driving home and missed feeling the quake by about 30 seconds. Melissa had just gotten home and said it was pretty strong here in Orange County. Most of my local Facebook friends agree. Meh. Was not much around our house. We’re far enough away that the dangly crystal bits on a table lamp swayed a little, and all the dogs decided to wake up, run to and bark out the back door for a few seconds. Daughter freaked out a bit–but it was not that heavy near the LA/San Diego coastline. 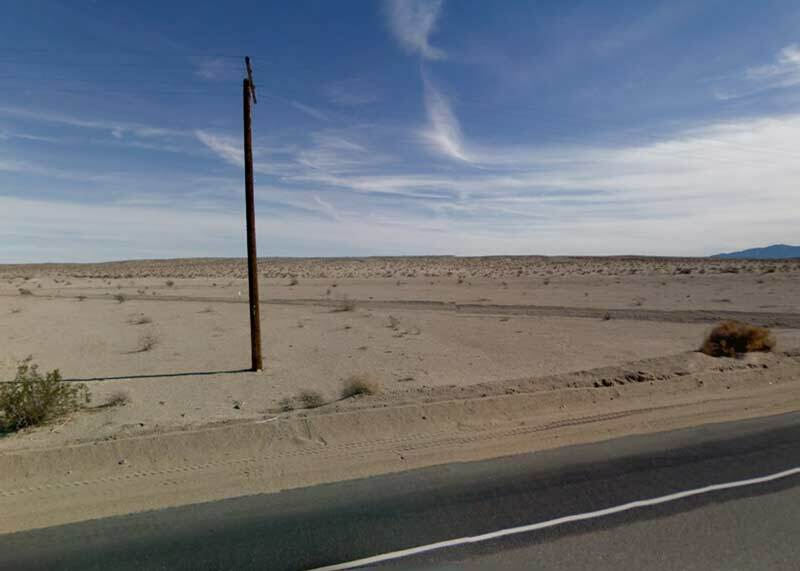 I’ve driven through Ocotillo–and you are correct–there is NOTHING out there. The rest stop on the highway center divide is just a bunch of porta-potties, no water or other facilities.